Type 8902 Spring Wire PVC Suction Hose combines the best of a clear PVC tubing with a reinforced suction hose. 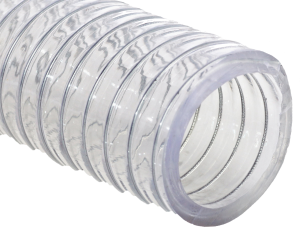 The wire is fully embedded in the hose wall, leaving a smooth clear PVC tube and cover. The spring wire adds vacuum capability as well as reduces the potential for kinking in tight bends that is a common occurrence in non-reinforced plastic tubing. Made with non-toxic food grade materials in compliance with FDA & RoHS standards. Offered in a wide range of sizes. Use in food and beverage transfer, general pump and industrial applications, hydro-seeding and more.